Unfriendly Fire (Feindlicher Beschuss) inkl. 0% MwSt. 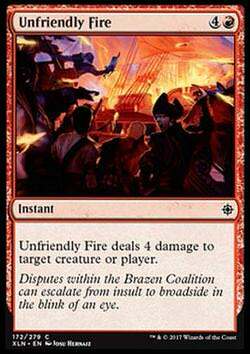 Regeltext: Unfriendly Fire deals 4 damage to target creature or player. Flavourtext: Disputes within the Brazen Coalition can escalate from insult to broadside in the blink of an eye.